Line tray with cooking parchment paper. In large bowl, mix granola, coconut and cacao nibs; set aside. In food processor, add dates, almonds and water; pulse in 1-second bursts until finely chopped, about 10 bursts. Add almond butter, honey and salt; process until well blended and mixture comes together into a ball. Add cherries; process in 1-second bursts just to coarsely chop cherries and mix them into date mixture. Transfer date mixture to bowl of granola mixture. Coat hands lightly with olive or vegetable oil; use hands to blend mixture. Using a tablespoon measure, scoop out by level tablespoonsful, and shape each portion into a ball; place on tray. Refrigerate about 1 hour or until firm. Store in tightly covered container in refrigerator up to 1 week. Be sure to use medjool dates for this recipe. Medjool dates are known as the “soft” date. They are the largest and prized for their sweet taste and juicy, soft flesh. Medjool dates can be found in grocery stores specializing in organic foods. 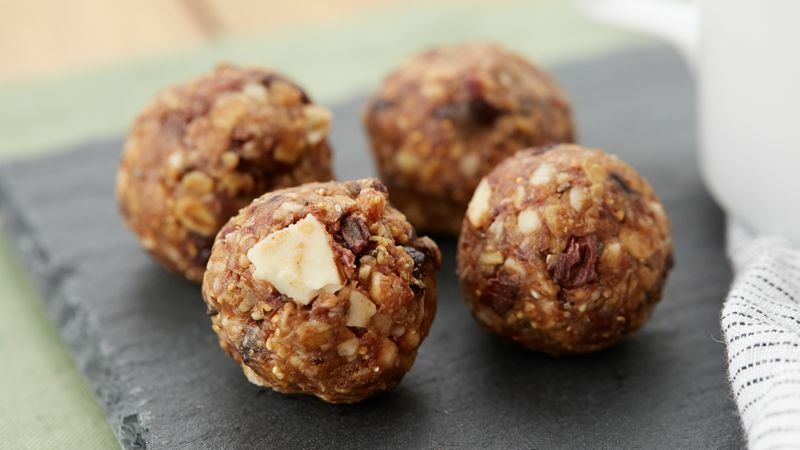 These granola bites can be stored in the freezer in a tightly covered container for up to 1 month. Thaw before eating.